خلیلی, سید محمدرضا, صدیق, یاسر, میرمحمدحسین اهاری, سید مهیار. (1395). مطالعه تجربی و عددی کمانش نیم استوانه مشبک کامپوزیتی. علوم و فناوری کامپوزیت, 3(3), 269-276. سید محمدرضا خلیلی; یاسر صدیق; سید مهیار میرمحمدحسین اهاری. "مطالعه تجربی و عددی کمانش نیم استوانه مشبک کامپوزیتی". علوم و فناوری کامپوزیت, 3, 3, 1395, 269-276. خلیلی, سید محمدرضا, صدیق, یاسر, میرمحمدحسین اهاری, سید مهیار. (1395). 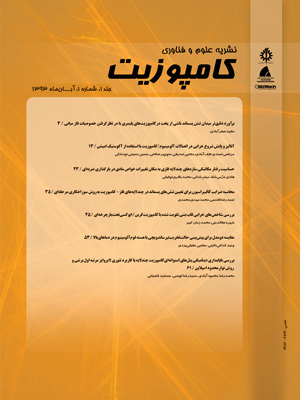 'مطالعه تجربی و عددی کمانش نیم استوانه مشبک کامپوزیتی', علوم و فناوری کامپوزیت, 3(3), pp. 269-276. خلیلی, سید محمدرضا, صدیق, یاسر, میرمحمدحسین اهاری, سید مهیار. مطالعه تجربی و عددی کمانش نیم استوانه مشبک کامپوزیتی. علوم و فناوری کامپوزیت, 1395; 3(3): 269-276. سازه‌های مشبک کامپوزیتی از سازه‌های نوین هستند که به‌دلیل دارا بودن فوایدی همچون استحکام ویژه بالا، سبکی و مقاومت به خوردگی، کاربرد روزافزونی در صنایع مختلف دارند. از جمله کاربرد این سازه‌ها در صنایع موشکی، ماهواره‌برها، بدنه هواپیماها و صنایع دریایی می‌باشد. این سازه‌ها معمولا از دو بخش پوسته و بخش مشبک تشکیل می‌شوند. بخش مشبک این سازه‌ها از سیستم ریب‌های مورب، حلقوی و طولی تشکیل شده است. در هنگام بارگذاری، انتقال نیرو از پوسته به ریب‌ها اتفاق می‌افتد و ریب‌ها بار را در کل سازه پخش می‌کنند. در این مقاله ابتدا به نحوه ساخت نیم استوانه مشبک کامپوزیتی اشاره می‌شود. در ادامه با استفاده از نرم‌افزار المان محدود آباکوس به بررسی رفتار کمانشی سازه نیم‌‌استوانه مشبک کامپوزیتی پرداخته شده است. به‌منظور تحلیل شرایط مختلف تاثیر پارامترهای مختلف از جمله ضخامت پوسته و زاویه لایه‌های پوسته نیز در تحلیل عددی بررسی شده است. همچنین میزان تاثیر پارامترهای مختلف از جمله الگوهای گوناگون و ارتفاع ریب توسط تحلیل المان محدود به‌دست آمده است. علاوه بر این، برای اعتبارسنجی نتایج حاصل از نرم‌افزار، آزمایش تجربی نیز انجام پذیرفته و مقایسه‌ای بین نتایج تجربی و عددی انجام شده است. Composite lattice structures, due to their advantages such as high strength, light weight and resistance to corrosion are recently employed in various industrial applications including aerospace and marine structures. These structures are usually composed of two major parts: the shell and the lattice structure. The lattice part is made of a system of Helical, Hoop or axial ribs. During loading, the loads are transferred to the ribs and the ribs distribute the loads throughout the structure. In the present paper, first the fabrication of the semi-cylindrical lattice structure is explained. Then, the buckling behavior of the semi- cylindrical lattice structure is investigated using the ABAQUS finite element software. The effect of various parameters such as the thickness and ply angles in the shell laminate were studied. Moreover, the effect of rib parameters such as different patterns and the rib thicknesses were obtained by finite element analysis. In addition, in order to validate the results, a comparison between the experimental and finite element results was performed. Huybrechts, S. and Tsai, S.,“Analysis and Behavior of Grid Structures,” Composite Science and Technology, Vol. 56, No. 9, pp. 1001-1015, 1996. Tsai, S.W. and Chen, H.J., “Analysis and Optimum Design of Composite Grid Structures, Journal of Composite Materials,” Vol. 30, No. 4, pp. 503-534, 1996. Kim, T.D., “Fabrication and Testing of Composite Isogrid Stiffened Cylinder,” Journal of Composite Structures, Vol. 45, No. 1, pp. 1-6, 1999. Huybrechts, S.M. Meink, T.E. Wenger, P.M. and Ganley, J.M., “Manufacturing Theory for Advanced Grid Stiffened Structures,” Journal of Composite: Part A, Vol. 33, No. 2, pp. 155-161, 2002. Vasiliev, V. Barynin, V. and Razin, A., “Anisogrid Composite Lattice Structure – Development and Aerospace Applications,” Journal of Composite Structures, Vol. 94, No. 3, pp. 1117-1127, 2012. Jam, J.E. Noorabadi, M. and Namdaran, N., Taghavian, H.,Mohammadi, M.,“Optimal Design of Annular Lattice Structures,” In Persian, Journal of Science and today's world, Vol. 2, No. 1, pp. 42-57, 2013. Rahimi, G.H. Zandi, M. and Rasouli, S.F., “Analysis of the Effect of Stiffener Profile on Buckling Strength in Composite IsogridStiffened Shell under Axial Loading,” In Persian, Journal of Aerospace Science and Technology, Vol. 24, No. 1, pp.198-203, 2013. Ghasemi, M.A. Yazdani, M. and Hosseini, S.M., “Analysis Of Parameters Affecting On Buckling Of Composite Reinforced Shell With First Shear Deformation Theory,” In Persian, Modares Mechanical Engineering, Vol. 13, No. 10, pp. 51-61, 2013. Yousefzadeh, M. and Jam, J.E., “Determine Fo The Stiffness Matrix Of Composite Lattice Cylinders Under Axial Load”, In Persian, 8th international conference of Iranian Aerospace Society, ST1071, 2009. Vasiliev, V. Barynin, V. and Rasin, A., “Anisogrid Lattice Structures – Survey of Development and Application,” Journal of Composite Structures, Vol. 54, No. 2, pp. 361-370, 2001.